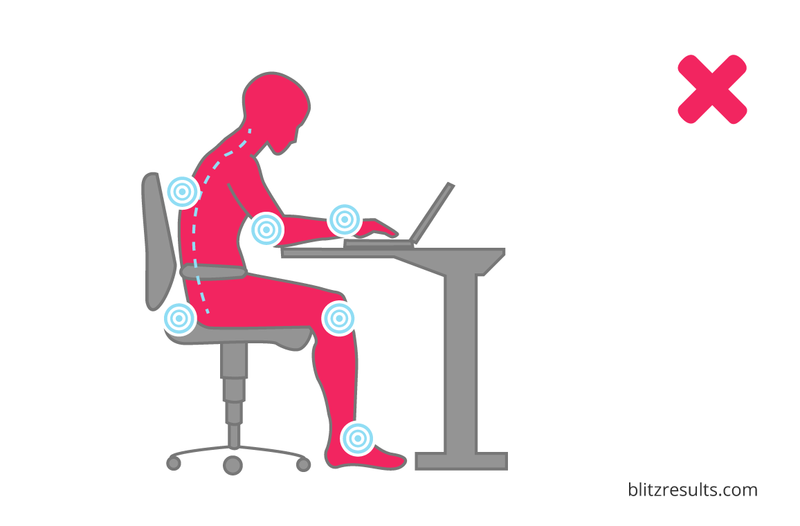 Incorrectly adjusted office chairs and tables lead, in the best case, to back and neck pain and, in the worst case, to permanent back or disc damage. Calculate the correct height of the desk and chair. To calculate the perfect height of a standing desk, please check here. Keyboard and mouse are placed in line with the elbows. Thus, the upper body is not permanently stressed on one side, which prevents cramps and disharmonies in the shoulder, back and neck musculature. Use hand supports! These prevent bending of the hands and gentle joints, tendons and nerves from the hand to the elbow. Disorders such as carpal tunnel syndrome or golfer’s arm are thus effectively augmented. The basin should be slightly tilted – ergonomic chairs and seat cushions help. Effect: The lower back remains in its natural hollow cross; discs and muscles are relieved. Your shoes should be placed firmly on the ground and as parallel as possible to each other. 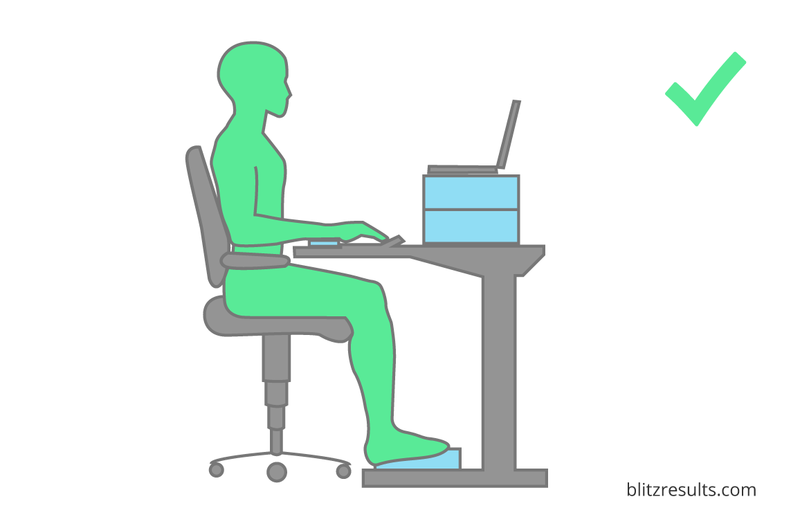 Effect: The body automatically assumes a healthy posture, the load is distributed evenly on both body halves, as opposed to the seat with the leg overlapped. Probably the most common incorrect position. Instead of sitting properly and leaning against the chair, one lounges into a corner of the chair and turns the upper body. The result: the neck and back are tight. In addition, the elbow is used to support itself. The result: the complete weight of the upper body rests on a very small point of the elbow; nerves and tendons are squeezed. Don’t cross your legs. The body is thus forced into a completely unnatural position. Above all, the lumbar area and neck are heavily stressed. Even this attitude is very unnatural. The area of the chair back is not used, the back is bent. Individual body points must absorb the pressure and are thus subjected to excessive loads or stress. The monitor is adjusted to the correct height by raising it. A silicone hand support protects the hands. And always remember: movement is good for the body and prevents unilateral stress. Use the tilting effect of the backrest to “cushion” yourself from time to time. And don’t forget: Stretch every now and then! Do you need special furniture? First, the good news: in most cases, you do not need special or particularly expensive furniture. Back pain is often simply due to the wrong posture for days, weeks, months. In most cases, it is, therefore, sufficient to adjust the chair and table correctly and to work on our own posture. 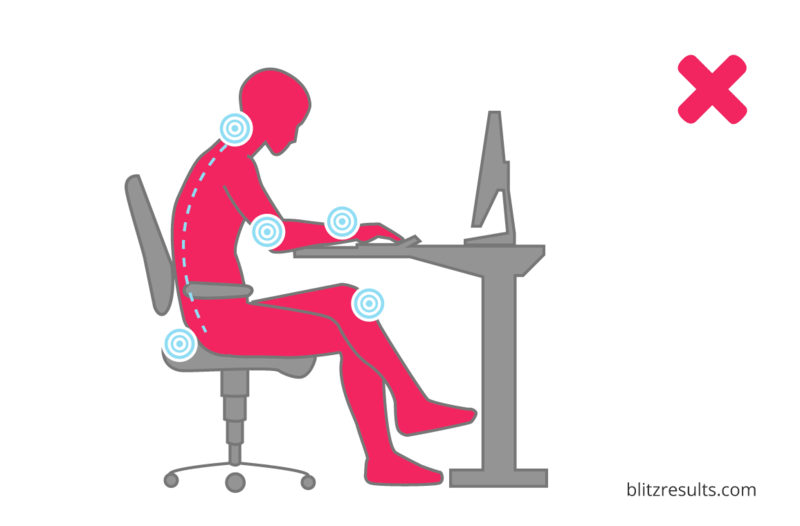 The right position of the office chair is crucial for an ergonomic office. When properly adjusted, it is much easier to align the table and monitor, keyboard and mouse correctly. Sitting all day long often results in excessive and one-sided strain on the back, irritating pain and a disturbance of concentration. Standing while working, on the other hand, has a positive effect on your concentration and your health. To calculate the right height for your standing desk, you need details such as your height and whether you wear high heels or not. All you need to do is input these details to our calculator to get an accurate result. Whether it’s an electrically height-adjustable table, an adjustable office desk from IKEA, or a simple office desk you built at home: in order to lighten the load on your spinal column and avoid back pain, the table has to be of the proper height. Depending on body size, the surface of the table has to be a specific distance from the floor. The calculator comes with lots of tips for ergonomic office design. Feeling comfortable in the workplace and at the same time improving performance? No problem. A height-adjustable desk brings dynamism to the office. Simply move it to the desired height at the touch of a button, lock it securely and change the working posture almost automatically. Standing instead of sitting has a positive effect on your concentration and your health! Many people in offices make the mistake of sitting almost all day long. This often results in excessive and one-sided strain on the back, irritating pain and a disturbance of concentration. Sitting/standing tables are the alternative. With these office types of furnitures, you can adjust the height of the tabletop flexibly, you can work alternately sitting and standing. This has a positive effect on your overall health. How exactly should the chair be adjusted? The chair should be adjusted to your own body as much as possible. This includes the adjustment of the seat, the armrests, and the backrest. The seat has the right height when the upper and lower legs form a right angle with each other and the two feet are flat on the floor next to each other. When seated, the entire seating area should be taken so that the back is supported by the backrest. Therefore, slide all the way to the back of the backrest. If an ergonomic chair is used, the armrests and the backrest can be adjusted in addition to the depth of the seat. The backrest should be adjusted so that the back is held in a nearly upright position and supported from the pelvic area to the shoulder blades. The height of the armrests is correct when the elbows are resting so that the upper and lower arm form a right angle while sitting. Armrests and the desk must be at the same height for work. With adjustable desks, height is no problem. Otherwise, something can be placed under the table for a table that is too low. If the table is too high, the seat height of the chair must be adjusted. If this doesn’t help, a footrest can be used. Use the result of the calculator as the starting point and set the table to this height. Afterwards, you can make a fine adjustment. The table should be so high that the elbows and underarms lie straight on the table with loosely hanging upper arms. If the tabletop is too low, it forces an unnatural curvature of the spine. If, on the other hand, the table is set too high, the shoulder girdle is pushed upwards and the neck and neck muscles are tense at work. 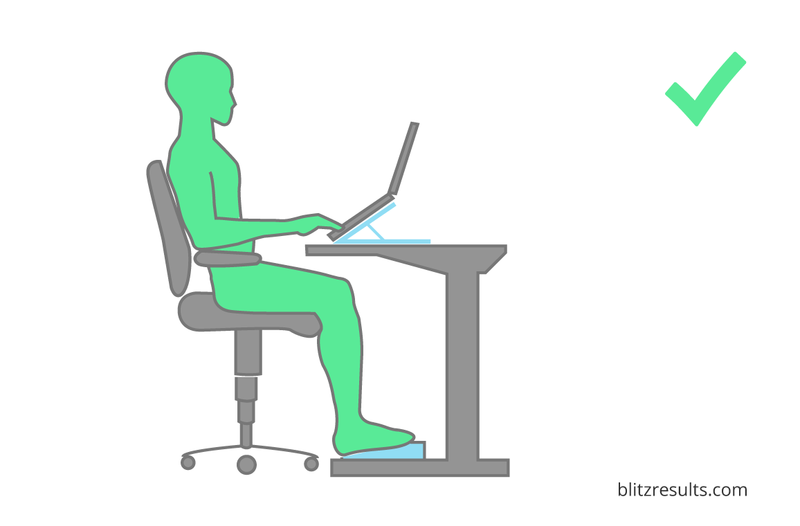 To calculate the perfect height of a standing desk, please check here. How does one sit properly? The tilting of the pelvis is directly related to relief for the spine. The pelvis should be at the same angle as when walking or standing. This is how the spine is optimally relieved. An office chair with a forwardly inclined seat and simultaneous backrest support ensure that the spine is in its natural double S shape. Laptops are not made for permanent work at the desk. The screen is too low and cannot be adjusted to the correct angle. The result: instead of leaning against the chair seat, you have to lean forward. The upper back and neck become tense. The lumbar area is stressed due to incorrect sitting. And the elbow, forearm and the tendons of the hand tend to rest on the sharp edges of the table and laptop. A special stand puts the laptop in a better position. 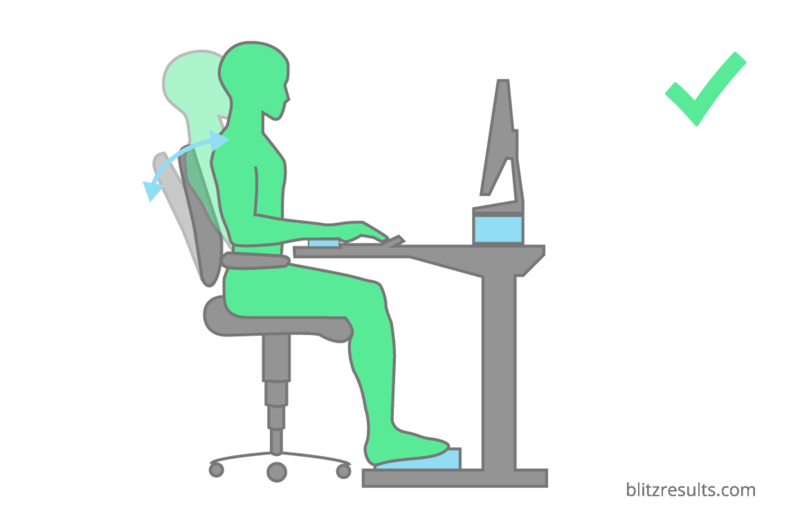 Nevertheless, the posture is not yet optimal, because the hands are not in a resting position and the monitor is too low. This should not be done on a permanent basis. If necessary, two or three packs of printer paper can be used to adjust the laptop to the correct height. With an external keyboard and a hand rest, the elbows, hands and tendon sheaths are also properly relieved. 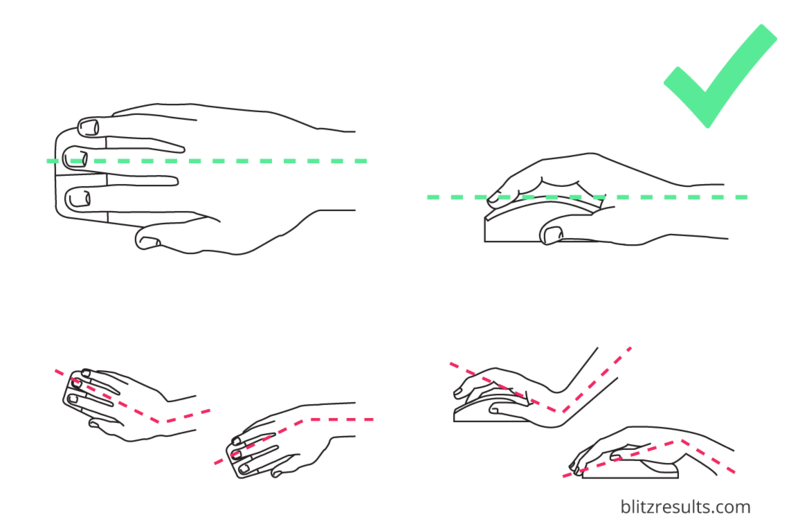 Really grab the mouse: Hold the mouse with your whole hand and try to maintain a straight line. The following trick may help: Simply try imagining the mouse as a “natural extension” of your hand. Do not bend your hands under any circumstances. 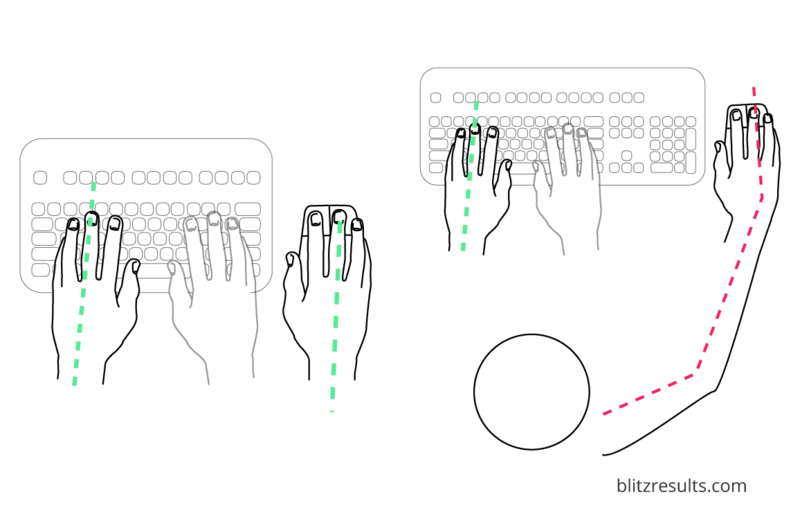 This also applies to the keyboard: The hands are aligned in a straight line, as an extension of the arms. In no case should the hands be angled or kinked. Even better for the hands and, especially, shoulders are ergonomic keyboards. The letters are arranged slightly obliquely, the hands and arms are thus in a natural position. A compact keyboard is better than a wide keypad with numeric keypad. The closer the mouse is to the keyboard, the more natural the posture is. Wider keyboards, however, are not good. 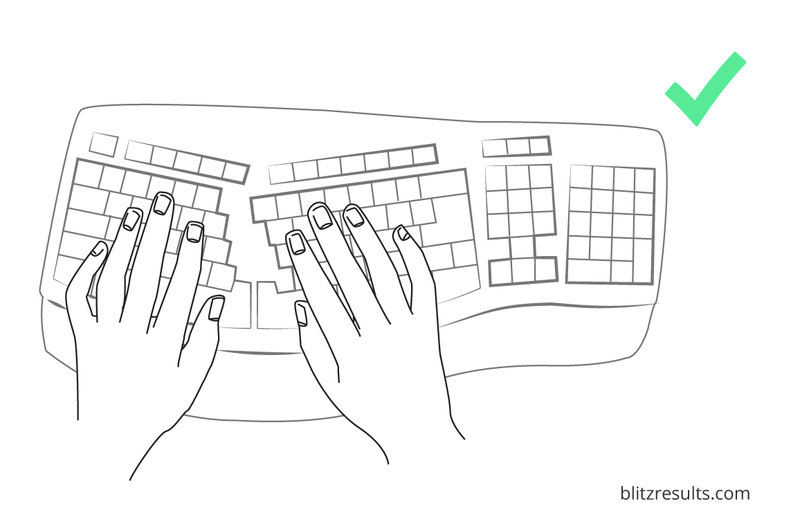 Because the wider the keyboard is and the further the mouse is away from the keyboard, the more the arm has to work. Back and shoulders are also under heavier stress. A complete training program or extensive stretching exercises are not always what’s needed. It’s often enough to simply include a bit more movement in the office day. Walk over to your colleague instead of calling him or her, or writing a quick mail. Drinking a lot of water is also a good idea. This is not only healthy but also requires regular walking. Please make sure that you have properly fitting shoes when walking or standing a lot in the office. Check our shoe size charts here. Avoid the elevator and take the stairs instead. The human body has been developed to be in motion. Walking is the most natural human movement. Therefore, it should be integrated as often as possible into the office day. Once the workplace has been set up, you can still work on the surroundings. In this case, small changes are often decisive. Sufficient fresh air and adequate lighting increase the concentration capacity. The arrangement of the furnishings can also be useful in order to improve the light situation and make working more comfortable. Personal objects and plants give the room its own touch. By regularly ventilating the area, the ability to concentrate increases significantly. Room plants also contribute to a better room climate in the office. Optimal working conditions are a pleasant 68 – 71° Fahrenheit and a relative humidity of 50%. If it is much cooler, it is likely that you use your A/C too much. The related energy consumption you may find here. The desk should be set up so that the hand does not cast a shadow in the writing direction when writing, but should never be positioned in front of the window! For editors and bloggers: All infographics of this site are released under a “Creative Commons License” and can be used free of charge. Please provide a source with a link to this page. Thank you! Incorrectly adjusted office chairs and tables lead, in the best case, to back and neck pain and, in the worst case, to permanent back or disc damage. Therefore, it is very important to calculate the correct height of the desk and chair. 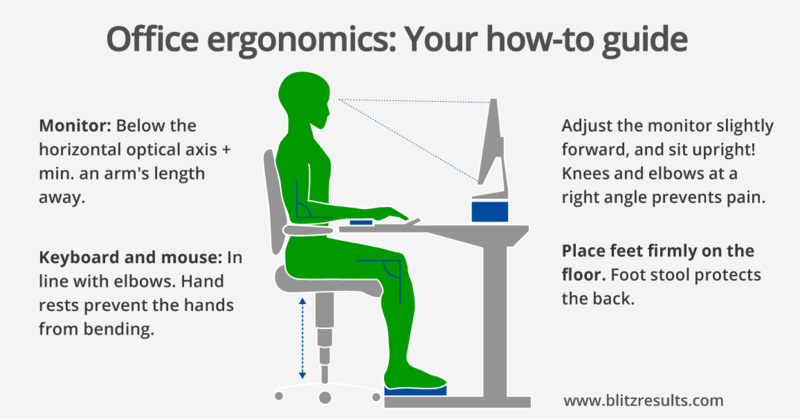 To have an ergonomic office: (1) The monitor should be placed below the horizontal visual axis and should be, at least, one arm’s length away. 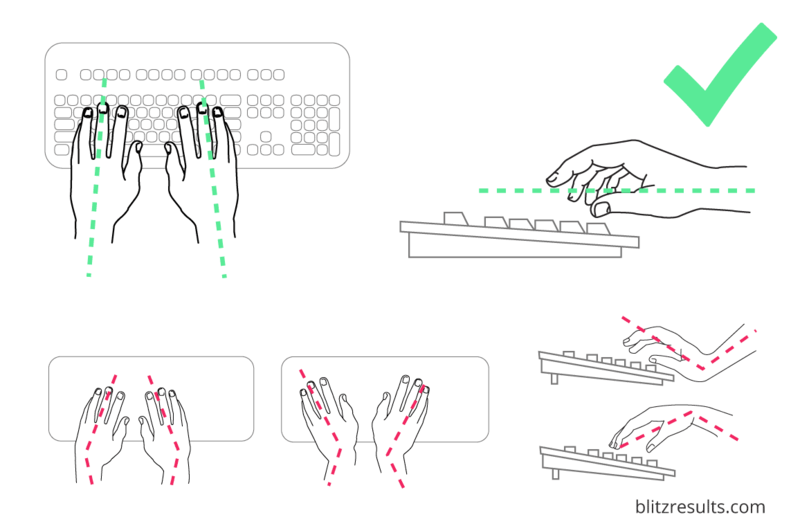 (2) Keyboard and mouse should be placed in line with the elbows. (3) The basin should be slightly tilted, with the knees and elbows at a right angle. (4)The feet should be placed firmly on the ground and as parallel as possible to each other. To avoid the unnatural curvature of the spine or the tensing of the neck and the shoulders, the table should be so high that the elbows and underarms lie straight on the table with loosely hanging upper arms. 4 Do you need special furniture? 8 How exactly should the chair be adjusted? 11 How does one sit properly?